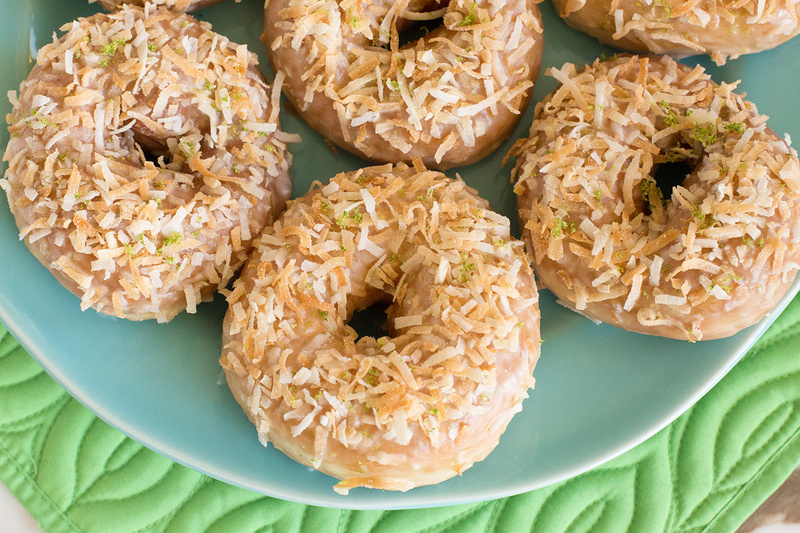 The fabulous combination of coconut and lime make these doughnuts delightfully good. Poke holes in roll centers and stretch to form doughnuts with large centers. Place on large sprayed baking sheets. Cover with sprayed plastic wrap and let rise until double. Pour oil, 3 inches deep in small saucepan or electric frying pan and heat to medium high. Remove wrap and fry doughnuts on each side 15-30 seconds or until golden. Remove to paper towel to drain. Place cooled doughnuts into glaze to coat top. Sprinkle top with coconut and lime zest.